Spanish Steps Makeover: Isn’t she pretty? Welcome back Spanish Steps! Rome’s iconic Spanish Steps just reopened following a nearly year-long renovation. The majestic steps, which rise from Piazza di Spagna up to Trinita’ dei Monti church, have provided the beautiful backdrop for countless movies, print ads, TV commercials, wedding photos, postcards, marriage proposals, and more selfies and instagrams that you can imagine. It is said to be Italy’s most photographed site. For weary tourists the steps offer a place to sit, for free, and enjoy some classic people-watching. Notice starry-eyed lovers, older couples arm and arm, mother-daughter couples out fashion shopping, business people rushing about talking to their phone with dramatic gestures, taxi drivers hanging out debating the fine points of last night’s soccer game, and fashionistas strutting their beautiful stuff, always with a designer shopping bag in hand. They say that gold is a safe investment because its value rarely depreciates. In Florence, the stability of gold manifests in a different form: the Ponte Vecchio. Forever fascinating, the neighborhoods on either side of the Ponte Vecchio [Old Bridge] are highly sought-after locations for our Italy Perfect vacation rental apartments. While modern travelers know the bridge for its illustrious jewelry shops, its history will make it even more interesting. Beneath the glitz of gold chains is a bridge that has stood the test of time. It is the location, not the wares themselves, that make this place so special. 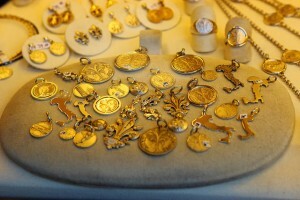 A gold necklace can be purchased almost anywhere, but gold purchased on the Ponte Vecchio is not just gold. It is an experience. 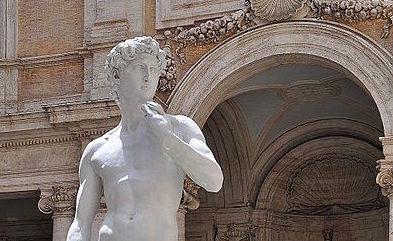 Or is it the art of the master: the curls of hair, the casual stance, the severity of his stare –all demonstrating the skill of the craftsman as he closes the gap between stone and reality? Is there a glimmer of concern in his expression? Perhaps, but only just enough to create a sense of camaraderie with the viewer. The center of Rome is teeming with life. Tourists course through the streets in rapid motion, creating a constant influx of energy keeping an ancient city alive and vibrant. It is therefore no small irony that the Colosseum, the most well known icon of Rome in the heart of the city, has a long history of mortal sports. 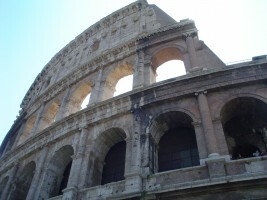 Commissioned by Emperor Vespasian and opened in 80 A.D., the Colosseum is mesmerizing in its size and grandeur. While much of the original façade has fallen to ruin, the remains pique the imagination – invoking visions of glory. The amphitheater was in active use for four centuries and hosted a menagerie of events – gladiator competitions of course, but also animal hunts and even public executions. Thus while the enormity of the Colosseum gives a sense of grandeur, the wise visitor knows they are standing in a place that generated far fewer victors than victims.